The word "mystery" is of Greek derivation, and dates from pre-Christian times. For the ancient Greeks, "mysteries" were those religious rites which involved some process of "initiation", that is to say an introduction into and familiarisation with some "mystical" and hidden truths. The most well known of these rites were the "Eleusinian". From the verb 'muw' (initiate) - which means "I half close my eyes" so that I can delve more deeply and ponder by limiting the external light which does not allow me to concentrate within - are derived the words "mystery", "mystical", "mystic", "mystagogy" etc, which all refer to the many-faceted and forever unsearchable reality of depth, in contrast to the flat presence of the surface. Christianity borrowed the word "mystery" from here, thereby giving it an even deeper and more sacred meaning. The "mysteries" of the idolaters are as far removed from the "mysteries" of the Church as the truths of the world are from the truths of God. The word "sacrament" is often used for mystery in modern Church terminology in order to express the visible "action" in the context of worship with which invisible grace is transmitted to the faithful. Thus we mainly speak of the seven mysteries or Sacraments of the Church without this of course signifying that the salvific grace of God is necessarily or exclusively bound by those concrete "actions". There is however a more general meaning of the term "mystery" which expresses the undefined total of known and unknown truths which regulate the position and the relationships of the individual person with God and with fellow human beings, within the entire plan of Divine Economy. For, as it has been correctly stated, "no man is an island". Within this broader and more general meaning, every human person possesses his or her own mystery, just like unique fingerprints, regardless of the external appearance of that person's life. This mystery, while no doubt unknown to others, remains largely unknown even to the very person concerned. Yet when the mystery of the individual person has a decisive significance for the salvation of others - and this is mainly true in the case of the Saints - then the personal mystery no longer remains a secret with seven seals. For, as the late Father Paisios had said, "the Saint hides himself, but the Grace of God reveals him". It "reveals" him not of course for the "praise of people", but for the salvation of many. Thus, the confession and gratitude of those who benefit becomes, without even trying, a revelation and an amazing commentary on the hidden aspects of one's personal mystery. If this follows in terms of "decoding" the unseen aspect of the mystery of each "chosen vessel" and instrument of divine grace in this world, then it is only natural that this should occur more profoundly in the incomparable "mystery" of the Virgin Mary. The period of compunction in the first fifteen days of August, with traditional fasting and daily Supplication services, gives us again this year an opportunity to recall a few of the many benefactions of the Mother of God towards the whole human race. These truths however surpass logic, which is why we will appeal to the conscience of the faithful, rather than their logic. And we will recall several of the unique goods which the Virgin Mary, being "full of grace", has secured for us, and which she continues to maintain in our midst through her ceaseless "intercessions". The leading theologian of the 14h century. St Gregory Palamas, Archbishop of Thessaloniki, in admiring the unsearchable "mystery" which the Virgin Mary silently crystallised at the centre of the Divine Economy, even goes as far as to say that Mary the Mother of God is "the cause of all those who have gone before her, and the guardian of all those who come after her". No matter how strange this description may seem for a creature of God -even if this is the Virgin Mary- we shall see below that this is not an enthusiastic exaggeration of love, nor a rhetorical device which is called "poetic licence". On the contrary, this statement is a most precise and profound theological definition, worthy of the great Teacher of Orthodoxy. If theosis i.e. deification of the human person was the '"pre-eternal will" of God, which looked towards the Incarnation, it is clear that the "giving" of human nature by the Virgin Mary to the Son and Word of God was the highest goal of the entire Creation. For this reason "all that was before her" are justifiably considered as being directed towards the Virgin Mary, as the "final cause". And precisely because she has such a crucial relationship with all who went before her, she is then the protector "of all who came after her". In this way, the Mother of God is presented as the "key" of all Creation. Having the supreme and central soteriological event of incarnation as a foundation, we can easily verify various other corresponding features of the Virgin Mary, which give a more detailed account of her incomparable personal mystery and grandeur. It was precisely this most central position and relationship of the Virgin Mary with the entire plan of the Divine Economy which allowed the Church Fathers to form and develop not only a typological, but also a substantial parallel between the Virgin Mary and the Church in general. The central axis of this parallel is the fact that both are simultaneously Mother and Virgin, having maternity and virginity absolutely, since both are brought about "by the Holy Spirit". The almost complete identification of the mystery of the Virgin Mary with the mystery of the entire Church is perfectly and epigrammatically expressed even in the Psalmic verse "glorious things are spoken of You, O city of God" (Ps 87:3). It is the unique case in all of Creation when one single person "represents" the entire city of God, that is to say the multitude of "people being deified". This image alone would be sufficient to declare for all time the breadth and depth of the mystery of the Virgin Mary, which she herself had confessed with contrition and appreciation when foretelling doxologically: "from now on all generations will call me blessed" (Luke 1:48). The fact that the gestation and incarnation of God the Word from the pure Mother of God was the climax and unique service towards humanity and the entire Creation, did not hinder St Maximos the Confessor from teaching that the unique example of the Virgin Mary must, in some sense, have a continuation and reflection in the life of each of the faithful. 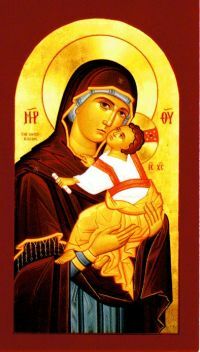 Every faithful person must "bring forth" the Word of God in his life and become, in a personal way, a kind of Bearer of God (Theotokos). This of course does not signify a repetition of the "hypostatic union", which would be an unacceptable heresy and blasphemy. However, what is meant here is of course a bringing forth of the Word of God in a moral sense in each person through the divine grace which is afforded by the communion of the Holy Spirit, with the sacramental life of the Church. At first glance, one may tend to believe that the first of the three features above was in fact the cause from which the other two blossomed, as a kind of reward on the part of God. Yet a more careful examination will reveal that all three of these are equivalent or are, in other words, three different perspectives on the same reality with which God endowed her who is "full of grace". The utter humility and obedience of the Virgin Mary means that she left herself totally in the hands of God. Upon this precise point the "evervirginity" of the Mother of God is founded and sealed for all time, which is also why we should not restrict this only to her bodily integrity, but rather to her entire conscience and person, which never permitted the slightest divergence (or wandering) from the divine will. And when the rational creature of God, which is His icon, freely chooses utter humility, thereby maintaining the continual virginity with regard to the divine will, then it is clear that such a person has by the grace of God reached incorruptibility, which the Assumption infers. and the tomb itself becomes a ladder to heaven..."
For this very reason the early Church considered the "Birthday" not to be one's birth into the world, with all of the uncertainties that would follow, but rather the day of one's falling asleep in the Lord, which definitely sealed not only earthly time, but also the final physiognomy of that person in the Kingdom of God. This is also why the Orthodox, when keeping their Tradition, celebrate namedays rather than birthdays.